IRCON ISL Recruitment 2019 - Job notification for 18 Dy. General Manager, Manager & Other Posts in IRCON ISL, Across India on Absorption. Applications are invited by IRCON Infrastructure & Services Limited on or before 13 May 2019 for 18 vacancies. 01 1. SSE/SE - ₹44900- 142400 Revised CDA (Pay Matrix Level 7), Graduate Engineer with 10 year experience in Signaling Maintenance and Construction. 2. JE - ₹35400-112400 Revised CDA (Pay Matrix level 6), Diploma Engineer with 20 year experience in Signaling Maintenance and Construction. 01 1. SSE/ SE - ₹44900- 142400 Revised CDA Revised (Pay Matrix Level 7), Graduate Engineer with 6 year experience in Signaling Maintenance and Construction. 01 JE - ₹35400-112400 Revised CDA (Pay Matrix level 6), Diploma Engineer with 13 year experience in Signaling Maintenance and Construction. g) CTC/ Proof of Pay Scale/ Grade. For candidates applying on Deputation Basis in IRCON, attested copies of APAR for last 03 yrs should be enclosed by the Forwarding Authority with the application. The envelope containing duly signed application should be clearly super scribed “Application for the post of “……………………”- Advt. No. 03/ 2019 on Immediate Absorption/ Deputation basis”. IRCON Recruitment 2019 - Job notification for 18 DGM, Dy Manager & Other Posts in IRCON, Across India on Deputation Basis. Applications are invited by IRCON International Limited on or before 13 May 2019 for 18 vacancies. 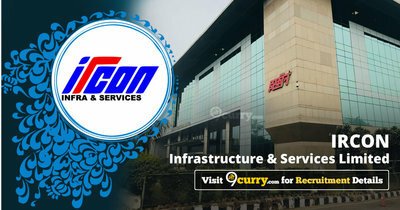 IRCON Recruitment 2019 - Job notification for Project Director Post in IRCON, Mumbai, Maharashtra on Deputation Basis. Applications are invited by IRCON International Limited on or before 30 Apr 2019 for 1 vacancy.